"The ring was made from a large piece of a 155-carat rough CVD lab-grown diamond which was polished using laser cutting and traditional techniques into a ring which has 133 facets, compared to 57 for a standard brilliant cut," HRD said. "The ring has a total weight of 3,865 carats. It wasn’t until 2017 that it became technically possible to grow large enough monocrystalline lab-grown diamond plates. "This is not the first ring to be created from a single diamond. 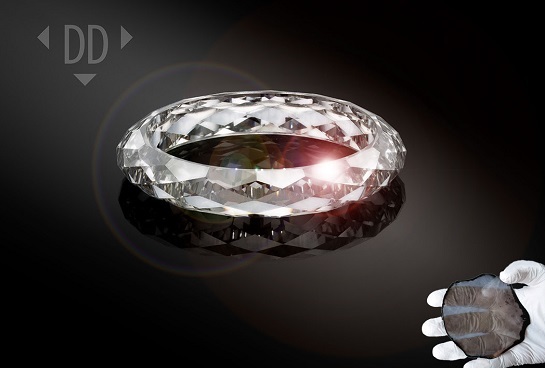 In 2011, Shawish, a Swiss jeweler, unveiled the world’s first wearable ring made from a single crystal of natural diamond. Additionally, another lab-grown ‘all diamond’ ring, called (RED), was conceived by the Diamond Foundry, but as far as we are aware, the production phase has not yet started."